Whether you say zucchini or courgette, if you grow vegetables in the summer, there's a good chance that you end up with a bountiful crop of them, especially if you grow vegetables here in the South of France like Papa. Thanks to Papa's garden, I'm on my third summer of having more courgettes than I know what to do with. Every week Papa shows up at my door with a large basket of courgettes and I give him a glass of Rosé and try to suss out what I'm going to do with all of them. The first summer of courgettes, I only knew one way to cook them, sauteed in olive oil with garlic and chili flakes and tossed with pasta. We ate that about three times a week (sorry Gregory). First there was Gwyneth Paltrow's Fried-Zucchini spaghetti, which was good, but just felt like a glorified version of the first courgette pasta I made so that woudn't do. Then came the Chicken-Zucchini Alfredo and Zucchini Pasta Carbonara, but after awhile, all that pasta starts to taste the same, so I turned to soup, which normally doesn't go well with summer but the Curried Zucchini soup I made was awfully tasty, even though it was hot as hades out. (For the record, cold soups like Gazpacho freak me out, so don't even bother mentioning them... they're just plain wrong). 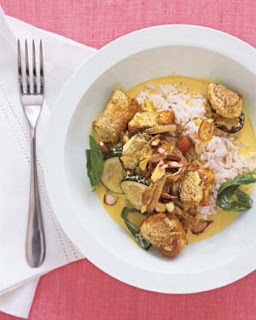 Inspired by the curry soup, I made Real Simple's Chicken & Courgette Curry, but that wasn't as much a curry as it was an essence of curry, so it was a bit blah and left me wanting. And of course I tried Gratins de Courgettes and Zucchini Lasagna, but quickly learned that having the oven on in my small kitchen is not very clever during the dog days. There was The Boot Blog's Baked Zucchini Chips which were easy and delicious too (but all of Marissa's recipes are delicious). And inspired by the most mouthwatering beignets that I had at a restaurant here in The LPV, I discovered Martha Stewart's Zucchini Scallion Fritters (luckily Papa grows scallions as well). 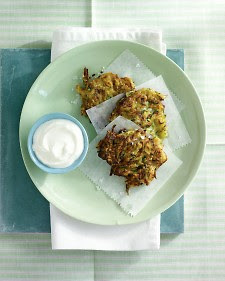 These were G O O D. But then, ever hopeful, I tried Martha's Zucchini-Potato Pancakes and was underwhelmed. The potato made them heavier without adding much flavor. F A I L. But it's OK, the Zucchini-Scallion Fritters are good enough to forgive Martha and her pancake indiscretion. Basically, this is what I've been doing this summer. Other than the occassional BBQ, and random Le Petit Village adventure, I've been in my kitchen cooking courgettes. It's all been rather dull. So pray tell, what did you do with your courgettes? P.S. 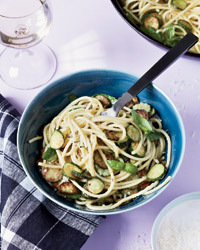 All of the recipes featured can be found on my Pinterest boards, Delish Dish and Butta la Pasta. Thankfully there are many ways to use zucchini since they grow prolifically almost anywhere. Besides the one's you mention, there are very good recipes for zucchini bread, stuffed zucchini's, and zucchini risotto. Courgette (zucchini) cake! I made two on Monday and I'm really enjoying them. I followed the recipe on this lady's blog (http://angalmond.blogspot.fr/)which is very easy. BUT it does only use 225g of courgette...which isn't that much when faced with a monster courgette, as I am. I once had zucchinis, that went bad. But I didn't know and almost ate it... Now I can't see zuccinis anymore. Mmmm, yummy! I have been loving stuffed courgettes, I use the round ones for convenience, but normal ones work too. There are tons of yummy ideas for fillings! I also tried making chocolate courgette cake (with the insides from the stuffed courgettes) but although you couldn't tell it had courgette in it at all, it turned out a bit gluey and not chocolatey enough for me. Last night I made a provençal-y tart: pate feuillté (flaky crust), a thin spread of tomato sauce with olives, sliced garlic, a mix of sautéed courgettes and white onions and topped with strips of roasted red pepper and more black olives. It got the big thumbs up. I have to say I am pretty fascinated by the zucchini boat idea though. And do you know the Smitten Kitchen blog? If not you will thank me!! Not only is it one of my favorite food blogs but she has an amazing index. hi Sara i made zucchini bread with chocolate chunks. it was really nice pdaddy wants me to make it again. aidan can send you the recipe if you want. i even used papas courgette! Melt 25g butter, chuck in about 3 sliced courgettes and cook gently. Then add some chicken stock (can be from a cube or bones) and milk (2/3 to 1/3) and simmer gently. The taste is far better than you'd expect and it's my boys' favourite soup. His Sara, thanks for those wonderful ideas as I'm often in the same general boat on the zucchini problem. I was just served zucchini sautéed for ages so it's all limp and slightly mushy with some mysterious North African spices, one of which was cumin... am trying to track down that recipe!! It was really really delicious. 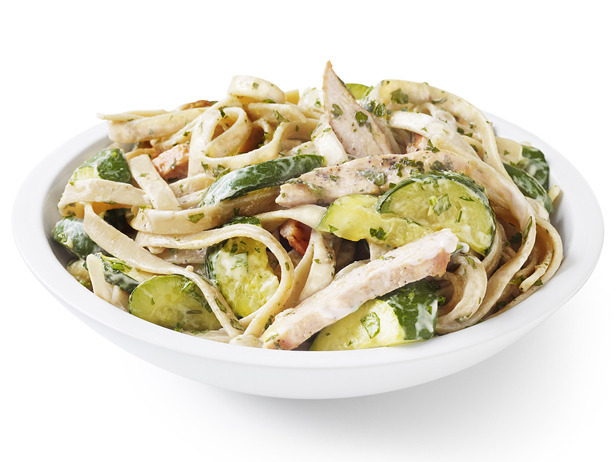 Hi Sara, How about Courgette Farci - we have loved that this summer. Growing up in New York, my parents always had a garden and we had so many zucchinis that my mother had to be creative - we use to joke that she could have written a cookbook - 101 ways to cook a zucchini! Zucchinis, onions, tomatoes - seasoned and cooked on the grill in foil is also very delicious. Thanks for your ideas! Enjoy the end of summer! The heat must be playing tricks with your mind because you're missing the obvious answer... Zuccchini smoothies!!! These all sound wonderful...I am so glad you have been the guinea pig! I, like you, have been searching for the perfect recipe...and the zucchini just aren't quitting. I had just found the Martha Stewart recipe...so glad you've already been there, done that! I made panzanella. I made it with summer squash, but just because I had an abundance ....but it works well with zucchini too.In fact the zucchini adds more color. It says cut on a mandolin. I did it with a veggie peeler. It should be eaten fresh....gets soggy if sitting around. Oh, I know what you mean. One year I wanted to grow Zucchini and at the end I had so many of them that I didn't know what to do. After two weeks of eating Zucchini I had enough and so I gave them to neighbors and friends and only ate them once a week. I made zucchini soup with curry which was pretty good. I'm really not a big fan of zucchini. I don't necessarily dislike them, but there are so many other vegetables out there that I like much more. zucchini just bores me - probably because my mother only ever makes them one way, and I'm just tired of it. Zucchini bread gets my vote--pretty yummy! But I must say, every chance I get to order fried zucchini, i jump at the chance! Perfect timing for this, as I just weed-whacked my jungle garden yesterday and discovered 2 enormous, multi-pound/kilo weight courgettes. Fried fritters it is! I made them last night.. grilled in the BBQ and then sprinkled with Parmesan. Those fried fritters look yummy :) and would definitely be making zucchini bread and freezing it for the winter months. I'm such a sucker for zucchini pineapple bread. The French are kind of weary though of courgettes in their cakes. For those who are like "Sara in le Petit Village" having more courgettes than they know what to do with, try these 5 recipes ! And send me yours !!! I've made just about everything that the others have suggested, they are all good but it remains to be too much courgette. I've seen a marinated salad I'm going to try next. Peel the zucchini and yellow squash, slice it very thin the long way using a veggie peeler to make long ribbons, then marinate in your favorite vinaigrette in the fridge, serve on a bed of greens. Have you tried giving 'em to the local Food Bank? Then it becomes their problem! I have been slicing mine very thinly lengthwise with my peeler or on a mandoline, drying the strips on paper towels and then a quick saute in some olive oil,squeeze of lemon juice and a sprinkle of fresh dill. I try to just warm them, without letting them get too soggy and the dill and lemon make them fresh and tasty. A non-courgette loving friend over last weekend even had seconds! YUM! Zucchini is one of my favorite vegetables! I just posted a chocolate zucchini bread recipe, and it was SO GOOD! Hmm, I've just been pinning a bunch of courgette recipes, but off the top of my head, sauteed in a little olive oil with some onion and garlic, then when soft, toss in some tinned tomatoes and sundried tomatoes and a little tomato puree, plus some herbes de Provence (I'm sure you've got a few of them kicking around ;o) ) Have you tried the provencal stuffed ones, the ones where you stuff beefsteak tomatoes too? The name of the dish temporarily eludes me, but you can get both meat and meat-free fillings. In a quesadilla with goat cheese! Can you get tortillas in the LPV? ps. I've been catching up on your old entries lately and was thrilled to learn that you are also a "Wire" devotee...best show ever! Well, we used to have zucchini bread when we were little ( and Dad's veggie patch was throwing out 10 zucchs a day). It was savoury, a bit like a corn bread, super delicious especially straight out of the oven with butter on it. I love zucchini soup, especially with one of Aidan's chipotle peppers blended through it. Bon app! I'm sure you've tried this, but back in our Italian house, we make zucchini flowers stuffed with goat cheese (my mom) or even more simple (me); zucchini fries. This is probably one of my favorite appetizers because while it's flash-fried (fancy talk), you still feel like it's not so bad because it is a veggie after all. There are tons of recipes on-line for these! Give it a try. I put them in Chili. They are a good filler and make it healthier. You are a thin mint, but I'm a chubby and one of my favorite things is to julienne the courgettes and use them for pasta. haha! aw, thanks sara! we have an abundance as well and i like to (as of late) grate them up and saute them with pasta. or grill them! I love courgette souffle served with home made tomato sauce. I also love courgette fritters & pea & courgette timbale. We don't really eat courgettes in our house - not too sure why because we do like them, maybe I'll try out your recipes and get into them! I really like the sound of the chicken one! We love them and either grill or roast them. I do love the zucchini flowers stuffed with goat cheese.... miam-miam! I don't make zucchini anythings! I don't really ever even buy them- I guess they aren't quite my thang. If I come across any great recipes though, I will share. Do you have a recipe for your ratatouille? I didn't think it would be hard to make until I saw Anthony Bourdain make it for his friends in Provence and they were not impressed lol. I've made a few different recipes, this is the last one I tried and it was pretty good. My favorite are stuffed zucchinis (or zucchini boats) - you can make them so many ways and put pretty much anything in them: other veggies, quinoa, rice, tomatoes, ie whatever you have laying around. I made some the other night that were taco flavored, and they were delish! Another one of my favorites is to grate them, carrots & onions and make latkes with them.